Immediate and continuous moisturizing, anti-aging effect, from the first sign of wrinkles. Revitalizing your skin immediately and for a long time, bringing you maximum comfort. Re-educating your skin, reviving the natural water-making mechanism, stimulating collagen synthesis to improve the epidermis elasticity. Protecting the skin from pollution and reducing wrinkles. Created for combination, normal and dry skin, even the most sensitive skin. To use on a daily basis on your face, day and / or night. Ivory colour cream, rich in active ingredients. Its fragrance evokes a floral bouquet which disappears after the application. Use this product daily on your face, neck and neckline, on clean and dry skin, using light circular movements (see our diagram below). 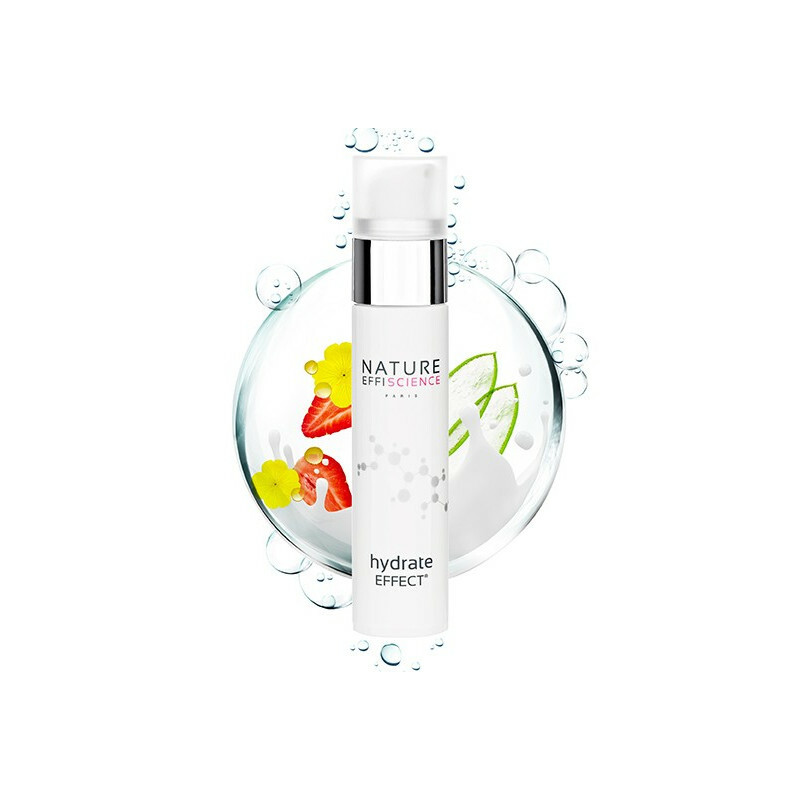 25 - 35 years old: Hydrate EFFECT® revitalizes your skin and prevent from first wrinkles. Ages 36 and over: : for best results, use Hydrate EFFECT® in the morning and apply a specific anti-wrinkle cream at night. Intensive hydrating action: you can use hydrate EFFECT® with the booster EFFECT® serum for a better efficacy. Thanks to the hyaluronic acid and the strawberry plant extract, your skin is oxygenated and more radiant. Anti-wrinkle action: you can also use Hydrate EFFECT® with the anti-wrinkle Lift EFFECT®for an anti-aging remedial action, combining a lasting hydration with a replenishing action. The epidermis becomes visibly smoother and more radiant, spots also decrease thanks to the combination of stoechiol and samphire. Use this skin care product daily on your face, neck and neckline, day and/or night, on clean and dry skin, using light circular movements, smooth along the forehead and the cheeks using a circular movement and smooth along the edge of the face. Press 3 times on Point 1 between the eyebrow arches. Press and smooth along the eyebrows..
Press 3 times on Points 2, one centimeter from the base of nostrils. Presse 3 times on Points 3, at the corner of the mouth. Press 3 times on Points 4 on the temporo-mandibular joint. Your skin is moisturized and comfortable all day long. 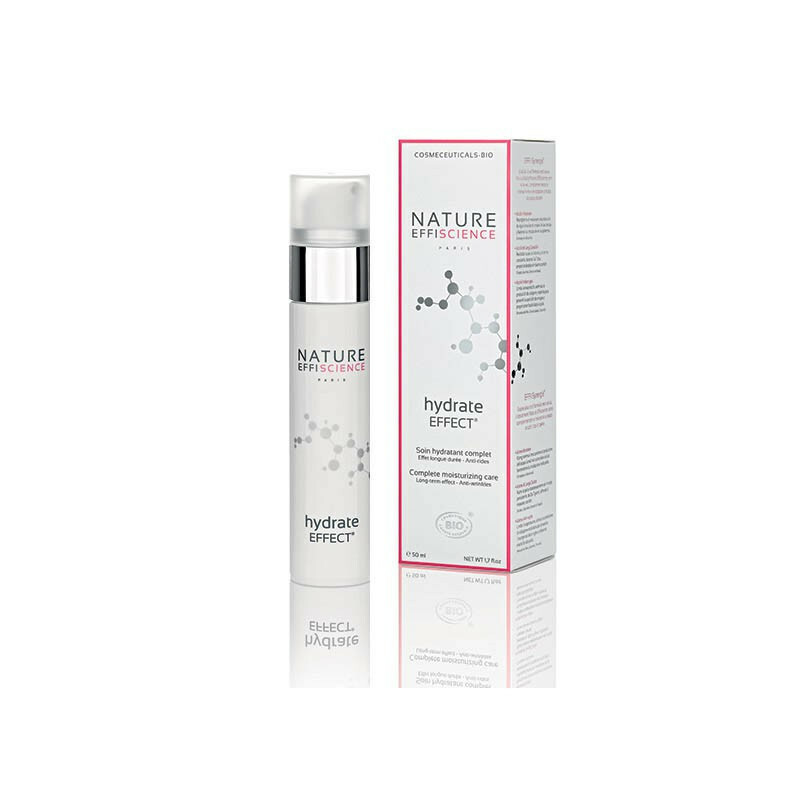 The Hydrate EFFECT® synergetic action instantaneously replumps the epidermis continuously, thanks to the combination of primrose oil, macadamia oil and shea butter with strawberry plant extract and Chlorella. Your skin is comfortable all day long, and increases its water reserve for a better elasticity and suppleness. Your skin is supple, elastic, even-toned and wrinkles are reduced. Visible results in 3-7 days. Your skin is increasingly moisturized with a lasting effect. The Samphire extract reeducates your skin, reactivating and regulating urea synthesis deep within the skin cells. This tailored skincare moisturizes and reactivates urea and collagen productions, improves water- making mechanism for the epidermis and prevents from evaporation and wrinkles. A powerful moisturizer for all ages and skin types, bringing immediate comfort and preventing dehydration. This skin care product has been tested under dermatological control with no visible skin reaction. hydrate EFFECT® contains no parabens, phtalates, mineral oils, monoethanolamine (MEA), diethanolamine (DEA), triethanolamine, silicone or animal ingredients. 73% of the formula is from organic agriculture. Its concentration in organic ingredients is 7 times higher than the Ecocert requirement for organic certification. Allowing hydration productionfrom the revitalization of the urea-making mechanism. Second skin effect, liberating hydration over time. Forme une seconde peau en laissant la peau respirer, délivrant de l’hydratation dans le temps. Protects from pollution. Protège contre la pollution. Primrose oil: Regenerating and soothing. Macadamia oil: Moisturizing and nourishing. Apricot kernel oil: anti-dehydrating, anti-aging. Stimulating collagen synthesis to improve elasticity and suppleness of your skin. Calming and soothing the most sensitive skin.